Menulog delivers for Binny's Kathitto so you'll be able to track your courier on a map. Tiger prawns sauteed with assorted masala flavoured with curry leaves and garlic. Squid sauteed with assorted masala flavoured with curry leaves and garlic. Spanish mackerel steak marinated with spices and then shallow-fried. Ground beef mixed with mashed potatoes, dipped in egg breadcrumbs and deep-fried. Tender chicken fillet cubes marinated in yogurt, spices and char-grilled. Tender lamb mince mixed with spices and herbs, rolled on a skewer and grilled. Shallow-fried potato patties topped with spicy chickpea gravy, green chutney, sweet chutney, yogurt and sev. Batter-fried spinach leaves topped with crushed papadis, potatoes and chutneys. Crisp-fried pastry filled with mashed potatoes, peas and spices served with tamarind chutney. Boiled egg in gram flour fried to a crunchy finish served with chilli sauce. Onion in gram flour fried to a crunchy finish served with chilli sauce. Sliced onions, carrot, cucumber, tomato, green chillies and lemon. Kathitto is East Indian street food made from flat roti coated with scrambled egg, topped with onion, capsicum, lime and mint sauce. Tender chicken fillet cubes marinated in yogurt, spices and grilled. Minced lamb mixed with spices, rolled on a skewer and grilled. Beef cubes marinated in spices and grilled. Chickpeas cooked in onions and spices. Cottage cheese cooked in creamy tomato onion and spices. Potato cooked in turmeric and spices. Choice of any 2 x meat or vegetarian. Choice of any 1 x meat or vegetarian. Whole fish flavoured with turmeric, lemon juice and red chillies. Sealed in banana leaf and grilled to get the authentic Kerala flavour. (3) Kerala style hopper pancakes made of fine ground raw rice and grated coconut served with gravy of your choice. (5) Kerala style spring hopper pancakes made of fine ground raw rice and grated coconut served with gravy of your choice. Spice crusted fish fillet cooked in coconut milk served with lemon rice. (2) Hand-made puffy and soft bread made from flour served with gravy of your choice. Steamed rice cake layered with meat masala along with papadum and served with gravy of your choice. Spicy curry of mixed vegetables (bhaji) cooked in a special blend of spices and served with soft bread pav shallow-fried in butter. (3) Puri - is deep-fried, round wheat flour bread served with spiced potato curry. Curd rice tempered with mustard, spiced dry chillies, curry leaves served with pickles and fried chillies. Duck cooked in aunthentic mouth-watering flavour of coconut milk, green chilles, ginger and spices flavoured with curry leaves. Pork curry marinated in rustic handmade vindaloo masala. Semi-gravy pork curry cooked in combination of black pepper, blended with fried red chilli and garnished with curry leaves. Lamb cooked in tomato, sauteed with assorted masala, flavoured with curry leaves and garlic. Pan-grilled lamb cutlets cooked in garlic, hints of ginger and green chilles. Goat cooked in tomato, ginger, spiced coconut and flavoured with curry leaves. Slow cooked goat with coconut milk gravy and mild spices. ‘Fish of the day’ in a mild coconut milk with carrots, onions and hints of ginger. ‘Fish of the day’ cooked in gummi-gutta tamarind, spiced red chillies with hints of ginger and garlic. Tiger prawns cooked with spiced red chillies, curry leaves, raw mango and coconut milk. Tiger prawns cooked in gummi-gutta tamarind, spiced red chillies with hints of ginger and garlic. Squid cooked in traditional Kerala spice with ginger, fried chillies, onions, tomato and squeeze of lemon. Beef cooked in coconut oil by blending it with fried red chilli and garnished with curry leaves. 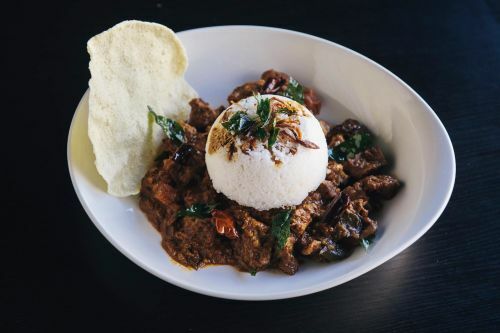 Beef cooked and sauteed with assorted spices, curry leaves and sliced coconut. Chicken curry cooked in Kerala style by blending it with fried red chilli and garnished with curry leaves. Semi-gravy chicken curry cooked in onion, tomato, other spices and finally blended with fried and ground coconut. Chicken with coconut milk gravy and aromatic spices. Grilled chicken cooked in creamy base tomato, onion, butter and spices. Boiled egg in tomato, onions and tempered with fried spices and herbs. Mixed vegetables cooked in Kerala style prepared with coconut, curd and as many vegetables as one can get. Mixed vegetable with coconut milk gravy and aromatic spices. Mixed vegetables cooked and blended with turmeric, green chilli and curry leaves. Cottage cheese cooked in creamy tomato onion base with butter and spices. Mixed vegetable dumplings simmered in rich creamy sauce. Cooked lentils tempered with fried spices and herbs. Slow cooked goat in blended spices served in saffron, flavoured basmati rice, raita, pickles, eggplant curry and papadum. An exotic blend of rare spices infused in chicken, cooked in basmati rice and served with raita, boiled egg and papadum. Seasonal mixed vegetables, dry fruits cooked with aromatic herbs and basmati rice served with raita, pickles, eggplant curry and papadum. Dosa is South Indian street food. A light crispy rice and lentil crepe served with sambar (lentil stew), coconut and tomato chutney. Crispy dosa smeared with sweet, spicy and tangy Mysore chutney wrapped around a savoury filling of mashed potatoes, onions, crackled mustard seeds and tempered spices. A crepe wrapped around a savoury filling of mashed potatoes, onions, crackled mustard seeds and tempered spices. A crepe wrapped around a savoury filling of cottage cheese, onions, crackled and tempered spices. A delicate and crispy paper-thin crunchy crepe tossed with ghee. A delicate and crispy paper-thin crunchy crepe tossed with egg. A delicate and crispy paper-thin crunchy crepe tossed with fresh chopped onions. A thick pancake topped with fresh chopped tomato, onion, coriander and green chillies. A thick pancake topped with fresh chopped onions. A thick pancake topped with fresh chopped tomatoes. A thick pancake topped with fresh shredded carrots. A thick pancake topped with fresh chopped coriander. All kids meal served with one Chapati or Parotta and any soft drink. Bread dipped in egg with spicy mint chutney and tomato sauce. Chopped chicken with egg, onions, capsicum and spices. Chopped beef with egg, onions, capsicum and spices. Chopped bacon with egg, onions, capsicum and spices. Shredded cheese with egg, onions, capsicum and spices. Chopped chicken or beef with egg, onions, capsicum and spices. Chopped tomatoes with egg, onions, capsicum and spices. Hand-made puffy and soft bread made from flour. Kerala style hopper pancakes made of fine ground raw rice and grated coconut. Kerala style spring hopper pancakes made of fine ground raw rice and grated coconut. Flat roti bread made from wheat. Traditional Kerala dish made with spiced yogurt and grated coconut. Indian yogurt with onion, tomato, chaat and black salt. Lentil stew with mixed vegetables. Basmati rice mixed with mustard seeds, turmeric and lemon juice. Traditional Indian long grain rice. Green chillies picked in vinegar, salt and sugar. Homemade pickle with sweet, tangy and spicy taste. Squeezed tamarind juice cooked with Indian spices. Crushed mint and coriander mixed with yogurt and spices. Sweet raw mango mixed with spices. Coconut crushed with green chilli and curry leaves. Crushed red tomatoes cooked in Indian spices. Thin, crisp, round shaped crepes made from flour and deep-fried. Spiced with ginger, cardamom, cinnamon, milk and rum. Spiced with ginger, cardamom, cinnamon and milk. A creamy dessert of flattened rice and sweetened milk flavoured with cardamom and cashew nuts. Grated carrot and sweetened milk flavoured with cardamom, cashew and ghee. Hopper pancakes made of fine ground raw rice and grated coconut soaked in coconut milk and sugar. Cottage cheese shaped into flattened balls soaked in thickened milk flavoured with cardamom and pistachios. Cardamom flavoured rich creamy and delicious ice cream made from evaporated milk and mixed nuts. Deep-fried dumplings made from milk solids and plain flour soaked in cardamom and flavoured sugar syrup. Refreshing sweet mango and yoghurt drink.